Booklet, stiff paper covers A4 landscape format, pp.18, including inside covers. Double page centre spread track plan, 17 B&W Illustrations. The Regions of British Railways were never in a position to emulate the huge output of “Below the Line” Public Relations activities of the “Big Four”; that is to say anything which merely promoted a favourable image of the organisation as a whole. With costs strictly controlled, any money spent had to be devoted to”putting bums on seats”. Hiking guide books, “Holiday Haunts” books, booklets about locomotives, rolling stock exhibitions, all became things of the past. a Information about locomotives was now catered for by the private sector in the shape of the admirable Mr. Ian Allan, and enthusiasts could subscribe for a few shilllings to the Region of their choice for lists of loco allocations and withdrawals The popular sale of posters (7s-6d DR size, 15s-00d QR size was stopped in the early 60s, partly because “Scenic” posters were now rarely produced, partly because it was becoming too expensive to print and store, more copies than were required to display on stations. As far as I can recall, on the North Eastern there was ony one rolling stock exhibition, at York in 1951, as part of the Festival of Britain, and one booklet of the “George Dow” type “The North Eastern Railway, a Centenary Story” by C.M. Jenkin Jones, 1955, in over a decade. 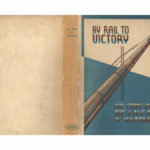 The British Transport Commission and later the British Railways Board issued Educational materials like wall charts and information packs, but these were expensive to produce and very limiteed supplies reached the Regions. The information pack was rationed to one per school. Improved printing technology came to the rescue, with the replacement of Roneo stencil machinesby off-set litho printers for producing the thousands of pages per week for movements advices. These were fast, capable of quality work, and the staff welcomed the chance of working on something different, so we were able to produce some attractive leaflets dealing with aspects of Eastern Region history (Eastern and North Eastern merged wth HQ at York). Matters changed somewhat wih “RAIL 150” in 1975. A number of publishers, libraries and local autgorities heard a bandwagon approaching and clambered aboard, making quite substantial sums. Why should Eastern Region not share in this bonanza? Pre the event, the market was pretty well saturated, but what about a souvenir record of the Steam Cavalcade. We were in control of the event, allocated press and photographers positions, and even had a couple of Whickham P-way trollies organised to follow the procession on the adjacent track. We had four staff photographers covering the event, they were prepared to work through the night processing their film. The design of the book was prepared in advance and time booked with a printer. “Cavalcade Reflections” was on sale within a week, and staff were packing and despatching advance orders. It sold thousands of copies, paying the salaries of two staff members for over a year, and providing a little money to bring to the table in negotiations for future joint publications. 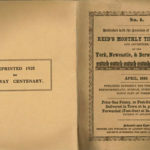 “This is York” originated in 1977, as the result of a request from the York Area Manager to have something published to celebrate the Centenary of the station. Time was quite short, so a full history of the station was not feasible, but could be told in outline by focusing on key subjects like the “Streamline” era and WWII. Again shortage of time precluded a outside printer, so the HQ reprographic team rose to the occasion. This was an additional benefit, because if the lithoplates were carefully cleaned and stored, the could be used again and again. On sale only through York Station Travel Centre, at a modest 20p, of which the seller got a small commission. It was still selling two or three years later, when the plates finally gave out , having sold between 3 and 4 thousand copies. In 1984-5 considerable investment was made at York, with a new travel centre and refurbished concourse, “Rail Rider’s World of Trains” opening and partial reconstruction of a wing destroyed by bombing. A week of events was organised including plaque unveilings and the reissue of a revamped “This is York” booklet bringing the story up to date. This was made possible by a joint venture with Batley School of Art and Design. I conducted tutorials with students, dealing with taking and interpreting a brief from a client, and aspects of print buying. A design competition was held, and this booklet was the result. 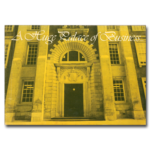 The College used the project to give the students experiernce in obtaining estimates and choosing a printer, before seeing the booklet through the press including proof reading. British Rail and the College shared the printing cost. Synergy! By pooling resources two organisations achieved a better result than if each had gone it alone.